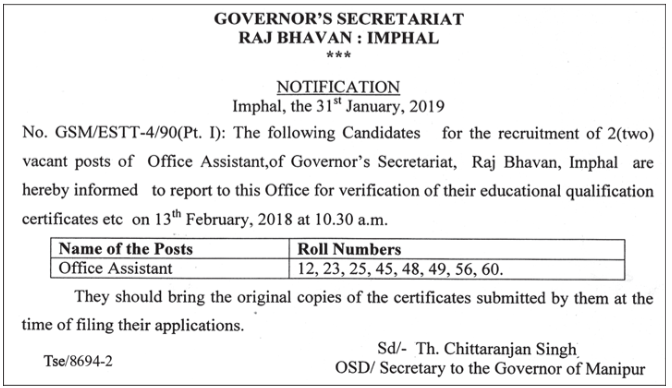 Governor’s Secretariat Raj Bhavan has informed to the following candidates whose roll number are listed below for recruitment of two posts of Office Assistant (OA) of Governor’s Secretariat Raj Bhavan, Imphal. Candidates has been informed to the office for verification of their educational qualification certificates etc on 13th Feb 2019 at 10:30 am. Candidates has also been informed to bring copies of the certificate submitted by them at the time of filing their application.